Rooftop Reviews: "The U.S. vs. John Lennon"
It looks so incongruous, the UNITED STATES versus john lennon. And it was. The largest Government in the world pitting all of it's legal forces against a musician, artist, and poet. John Lennon was a dreamer. He gave us two world anthems for Peace. When the Moratorium against the War was held in New York in November of 1969, the crowd was singing it. The record had only been out for a month, yet the message was clear, and embraced, far and wide. In 1968 John and Yoko had been arrested in Britain for Possession of Cannabis. This was now the reason that the United States Government, all the way up to President Nixon, would use to bar John and Yoko from America. The real reason, of course, were the anti-war activities in which they participated. And then the bar was raised with John Sinclair. John Sinclair was the manager of MC-5, the Detroit based rock band that played the free concert at the 1968 Democratic Convention in Chicago. He was also an anti war activist and avid pot smoker. In addition to this, he was a supporter of the White Panther Party, a radical group that supported the Black Panthers with rhetoric and cash. In spite of having been arrested on numerous occassions for his drug related activities, he continued to flout his drug use. He even staged rallies to legalize it. He was arrested and sentenced to 10 years in State Prison for possession of 2 joints, which he gave to a female undercover officer. His arrest and conviction prompted Abbie Hoffman to jump up on the stage at Woodstock to tell the crowd about it. Did Mr. Sinclair prod the system? Did he poke it with a stick, expecting not to be bitten? Probably, but 10 years for 2 joints of marijuana was really over the top,clearly an excuse to imprison him for his political views. It provoked an immediate public response. Enter, John and Yoko. By December of 1971 John Sinclair had been in prison for 2 years. His parole hearing came up and he was, not surprisingly, denied release. A concert was hastily organized at Ann Arbor's Crisler Arena. The performers included John Lennon (who recorded the song, "John Sinclair" on his "Some Time in New York City" album), Yoko Ono, David Peel, Stevie Wonder, Phil Ochs and Bob Seger. The speakers were Allen Ginsberg, Abbie Hoffman, Rennie Davis, David Dellinger, Jerry Rubin, and Bobby Seale. The concert was later moved from the Arena to outside the prison walls. Three days after the rally, Sinclair was released when the Michigan Supreme Court ruled that the state's marijuana statutes were unconstitutional. Earlier, in March of 1971, Congress, finally realized the power of the 18-21 year old age group, and had acted quickly to push through the 26th Amendment, which had given the right to Vote to 18 year olds. This presented an immediate problem; How to get those votes in the 1972 election. Enter, J. Edgar Hoover and Richard Nixon. They reasoned, that by deporting John and Yoko, they were sending a message to American youth. Drug use would not be tolerated and Immigration Laws would be enforced, regardless of who the person was. Remember, this was at a time when the Rat Pack roamed freely everywhere, as did Elizabeth Taylor and all the other "jet setters", along with with their pills and cocaine. Even the Rolling Stones were freely permitted to come and go as they pleased, in spite of the arrest of Mick Jagger in 1967. President Nixon had given Elvis presley a DEA badge in 1969, which allowed him to cross state and International lines without search. Clearly there was a double standard being applied to the case of John Lennon. The real reason behind all of this were the purported plans that John and Yoko had to appear outside of the Republican Convention in 1972. The Prsident and J. Edgar Hoover were not going to let this happen. 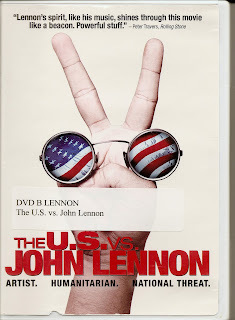 At this point they began Deportation Proceedings against the Lennons, a battle that would last 5 years. Armed with an Immigration Attorney, who initially informs the Lennons that their case is hopeless, John and Yoko embark on a tactic of procedural delays that will keep their visas extended for 6 months at a time. This arrangement could well go on forever. John and Yoko, at some point, realized that if they simply agreed to not appear at the Convention, the whole problem would be resolved. The funny part is that they had never actually agreed to appear there at all. It was just the speculation that he might do it that drove the Government crazy. The Convention was held, Lennon did not appear, and the extensions kept coming. Finally, on October 9, 1975, John and Yoko Lennon were granted permanent residency in America. And to top it off, this was John's 35th bithday, as well as the day his son Sean was born. A very insightful film that speaks to the forces of Government and how they can be aligned against an individual. This film makes you want to sing "Give Peace A Chance."